Some of you may know and some may not (and most may not care 🙂 ) but not only did I major in Bible in my undergraduate studies but I also majored in English. One of the remnants of that experience I still carry today is a love of poetry. . . . . Alright, everybody recovered? I know that may have come as a shock for some of you. One of my favorite poets is from the Romantic Period. William Wordsworth and I are kindred spirits. His love of nature and his ability to communicate his connection to the world around him has always stirred me. To stay in touch with my love of poetry, I subscribe to a daily email produced by the Writer’s Almanac. Every morning, there is a different poem in my inbox. Some days it is a classic and some days it is more modern. Today’s poem is William Wordsworth’s Lines Written in Early Spring. In this poem, Wordsworth paints a moving picture of being alone in a grove of trees in early spring. He noticed the singing of the birds. He observed the budding of plants and all the simplicity and freshness of what nature brings in spring. But in the midst of all the beauty and simplicity, he became aware of something. Bring sad thoughts to mind. In the midst of the serenity, beauty and simplicity of nature, Wordsworth was reminded of how complicated and jaded the rest of the world has become – particularly what man has made of man. As I read his lines today, it made me pause and think about how much better life would be if we all put aside our hypocrisy and politics and just lived life as ourselves; not trying to be someone we are not. Of course, there is something dangerous and raw about that that scares us. But wouldn’t it be nice? I have only seen the show a couple of times, but I really like the premise. Undercover Boss – what a great concept. The boss puts on a disguise and tries to blend in with the rest of the employees as one of them. Typically, the boss takes on jobs within the company working with people he or she has never met. The boss observes the employees and gets to know them. By the end of the show, the boss has developed opinions about the employees with which he or she has worked. The show wraps up each week with the boss calling each of those employees into her or his office and revealing the plot to them. It doesn’t always turn out wonderfully for the employees, but most of the time, the employee is praised and rewarded for his or her commitment to the company. Then the final segment of the show includes the boss addressing the entire company, explaining what has taken place. Many times, the boss expresses a renewed passion to make the company a better place to work. The few times I have watched the show, the boss has been emotionally affected by the experience and it shows in his or her address to the employees. The overall result is a strengthened relationship between the boss and the employees because now, he or she knows what it is like to “be them,” and the employees have learned to see the boss as one of them. As I watched this show for the first time, I could not help but think about how it is similar to what God did 2000 years ago. Obviously, there are areas where the similarities break down – God did not need to know what it is like to be us, God already knows. But, just as in the show, the end result of God coming and living among us was that there is no doubt that God truly wants a relationship with us. We aren’t just random beings on a planet that make no difference to God. God became one of us – to show us how to live and how to love and how to serve. The ultimate undercover boss! Today is the day! Today We Are Rich is available for purchase. As I said yesterday, this is a book you need to read. I began discussing the book yesterday – you can read that post here. Today, I want to give you just a couple of more thoughts on the book. Much of what these principles do is point us outside ourselves. The title of the book itself comes from a story in the book in which Tim’s grandmother gave more than she could afford to help someone else and yet, was left with a feeling of wealth that money can’t buy. Our culture teaches us that the world should revolve around us. These principles remind us that we are all in this together and true joy and happiness comes when we live in community – when we help others. These principles are really taken right out of the Bible. As I said yesterday, one of the most meaningful aspects of this book is that Tim, being internationally recognized as a consultant and speaker in the business world, never once makes an apology for the influence of his faith on his life. I find that very refreshing. In fact, I find that to be in line with exactly what God has called each of us to do and be on a daily basis. We are all to be ministers in our lives regardless of our professional occupation. 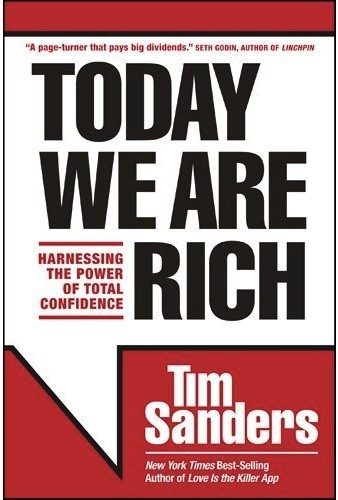 Thanks Tim for your book, Today We Are Rich. Thanks also for your example of how we can be successful in any area of society without neglecting or hiding our faith! Several years ago, I had the opportunity to hear Tim Sanders speak. He grew up in Clovis, New Mexico, but he made a name for himself in the midst of the dot.com era working for a time as an executive with Yahoo! I was pulled in by his charisma and passion for communication and then I was moved by what he said. Shortly afterward, I began reading his blog and following him on Twitter (@sanderssays). Over the last couple of years I have had to restrict the number tweets I actually get to my phone. But Tim’s tweets still come directly to me – why? Because what he says is always uplifting and beneficial. That is why, when he sent out a request for folks to preview his upcoming book, Today We Are Rich, I jumped at the chance. I received the book in the mail last week and dug right in. Now I must confess, I am not a big believer in the power of positive thinking. Don’t get me wrong, I know that there is significant power in positive thinking. But I don’t prescribe to a pie in the sky idea that we can change our world by simply looking at things with a positive attitude. I love how Tim approaches the subject. His thesis is this, “Positive thinking is an outcome, not a prescribed behavior. It requires much effort and discipline. It’s a lifestyle decision.” In the book, Tim gives 7 principles to follow in building a lifestyle that will promote positive thinking and thus, result in more confidence to live as God intended. One of the most meaningful aspects of the book for me is this: Tim is internationally recognized as a Fortune 1000 consultant and speaker. He has already written a New York Times Best Seller in Love Is The Killer App. He is sought after to speak all over the world in the area of leadership and business. But at no point in his book did he shrink from letting his faith influence his words. He boldly speaks of his discipline of reading the Bible every day as a means of staying grounded and “putting good stuff” into his mind. How many business and leadership books have your read in which the author’s faith was discussed openly? Tomorrow I will give you a few more of my thoughts on the importance of Tim’s book, Today We Are Rich. But for today, I have two challenges for you: 1) Find someway to contribute to someone else’s success today – even if you will gain nothing. And 2) Make plans to buy this book on Tuesday when it is released (You can take a sneak peak here). I can promise you, it will be worth every penny and even more worth your time! Sometimes the simple things are the most powerful. Take for instance the single word Thanks. Have you stopped to think about how powerful that little 6 letter word can be when used with meaning? I am reading a new book by Tim Sanders entitled, Today We Are Rich, and in the book there is an entire chapter dedicated to gratefulness. It is a great book that will be released this next Wednesday, so Monday I will be reviewing it here. Stop back by next week to get my thoughts on it. You can change a person’s day with a heartfelt thanks. When we stop and think about it, we can always think of things for which we are grateful. But do we dig deeper to think of the folks we appreciate? Take some time right now to think of two people you appreciate. Stop and thank God for them this morning. Then find some way to let them know how you feel. Who do you need to say “thanks” to today? Last week, our family spent two days skiing at Wolf Creek Pass. It was a great time! We had good snow and good weather. The lines were not long at the lifts and no one got hurt – a few bruises, but nothing serious. Our time together as a family was wonderful! We had never skied at Wolf Creek before. Overall, we enjoyed our time there. Our only real complaint was the lack of direction on the mountain. The trail map was clear enough. 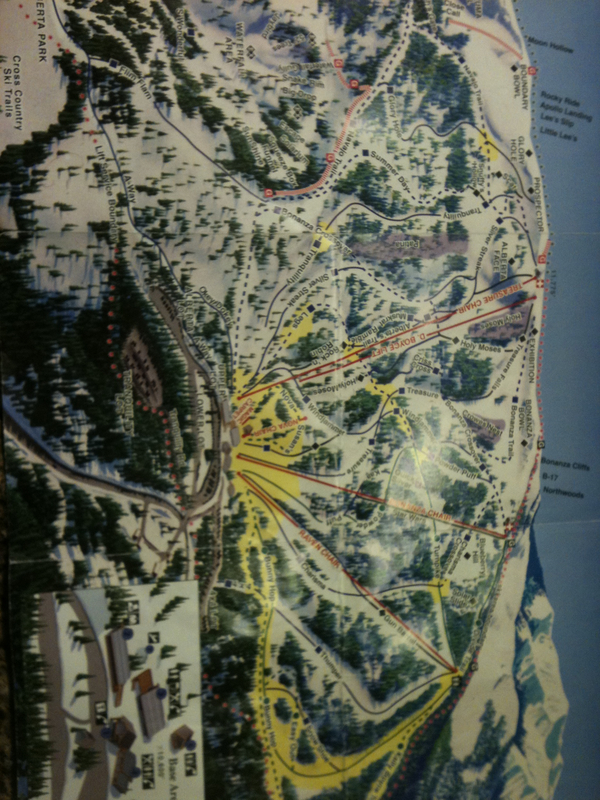 We could look at it and decide which lifts to take to get to the runs we wanted to ski – that was no problem. The problem came when we made our way off the lift (which is always a major event) and began trying to translate the information from the map to what we saw in person. The map was clear, but without markers along the trails, we never knew if we were on the right path. In a sense, we were skiing without a clue as to where were headed. So without markers along the path, not only does the skiing experience take on more of a challenge, it is also very frustrating. Our spiritual lives are just like that! We have a great trail map to help us on the journey – the Bible. We can see where we are and where we need to go. But where we often get frustrated or side-tracked is in our inability to see the markers along the way that help us to know we are on the right path. Unlike my experience on the slopes last week, more often than not, the markers are there, we just choose to ignore them. There are markers all around us every day – we just need to slow down long enough to pay attention to them. 1) Am I following the teachings of Jesus in the way I live every day? 2) Am I building relationships with other believers through involvement in a faith community or small group? 3) Am I striving to make a simple difference in at least one life each day? There are many, many other markers, but I encourage you to think about these today. And never forget, we also have a guide along with us – and that never hurts!